Mature involucral fruit of annual herbaceous plant Xanthium sibiricum Patr. of family Compositae. Collect the mature fruit in autumn. Big and full granule with brownish yellow color. Pungent, bitter and warm, toxic; lung meridian entered. Disperse wind-cold, relieve nasal obstruction and stop pain. It has inferior function to expel wind-cold therefore it is not commonly used for common cold due to wind-cold. But because of the action to relieve nasal obstruction and stop pain, it is often used for wind-cold syndrome manifested as headache and body pain, nasal stuffiness with discharge together with Qiang Huo, Bai Zhi and other herbs to disperse wind-cold. It has good effect to free nasal obstruction and relieve nasal stuffiness. It can also stop turbid nasal discharge, stop pain and relieve distention pain of forehead and nasal cavity with its warm and dry property. It can be applied either internally or externally with multiple effects for both symptoms and pathological changes such as nasal stuffiness, continuous turbid nasal discharge, loss of sense of smell and forehead pain. It has been regarded as an important medicine for treating nasal stuffiness since ancient times. It is suitable for wind-cold exterior syndrome with nasal stuffiness symptom and commonly used with wind-dispelling and pain-relieving herbs such as Xin Yi and Bai Zhi, for example, the Cang Er Zi San in Ji Sheng Fang(Lives-saving Prescription). The disease sinusitis is often caused by exterior wind-heat attack or damp-heat stagnation. For this disease, Cang Er Zi is often used with wind-heat-dispersing herbs such as Bo He, Ju Hua, Huang Qin or with heat-clearing herbs. It's also frequently used for other rhinopathy such as acute rhinitis, chronic rhinitis and allergic rhinitis. In addition, it can dispel wind-damp and stop pain of arthralgia to assist other wind-damp-dispersing herbs. It’s commonly used for wind-cold-damp arthralgia. It can also be used to treat pruritus and headache due to wind-cold. Decoct 3~10g or make it into pills and powder. 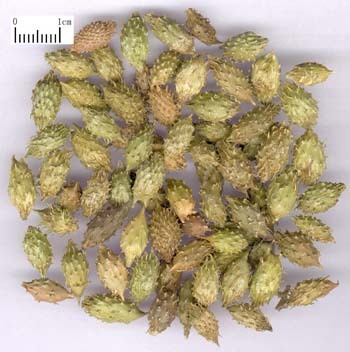 It should be roasted and ground to get thorns for better prescription and decoction of active component and less toxin. Not suitable for headache due to blood deficiency. Overdose will lead to toxication.